Launching in the fall of 2017, GOLD will be positioned in a geostationary orbit, ideal for imaging the Earth below. 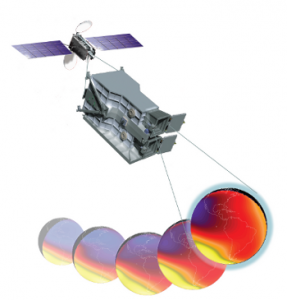 The instrument will make images of temperature and composition in the sun-lit thermosphere and of electron density in the nighttime ionosphere. By capturing the first global-scale images of conditions in Earth’s upper atmosphere on a cadence of 30 minutes, GOLD will provide critical data on subtle changes due to space weather events, according to Michael Hackman, LASP engineer and GOLD Program Manager. Space weather events originate on the Sun with ejections of material and x-rays into space. When directed at the Earth, they cause geomagnetic storms that sometimes interfere with radio communication and disrupt GPS satellites, impacting everything from airline travel over the poles, to high tech farming and cell phone reception, just to name a few things.